105-Year-Old Cyclist Rides 14 Miles In An Hour En Route To A World Record : The Two-Way "I am not here to be champion. I am here to prove that at 105 years old you can still ride a bike," Frenchman Robert Marchand said. 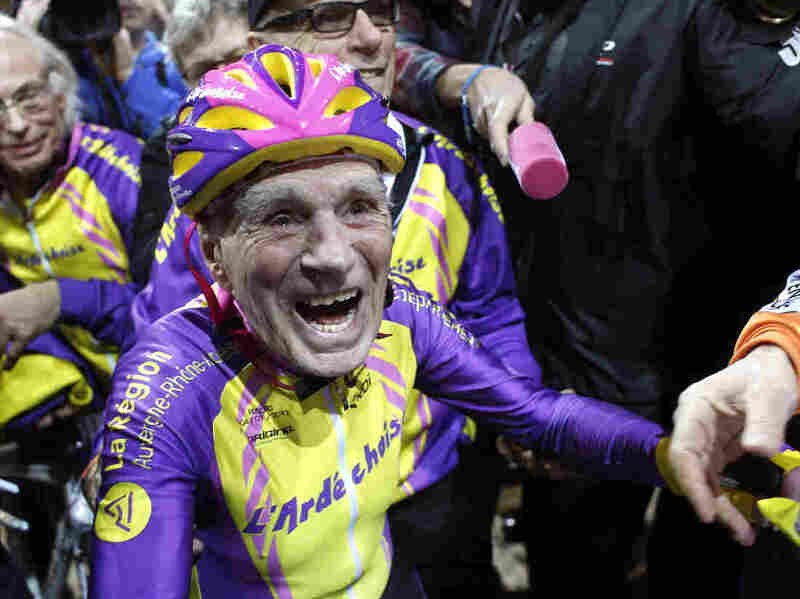 French cyclist Robert Marchand, 105, reacts after setting a record for distance cycled in one hour, at the velodrome of Saint-Quentin en Yvelines, outside Paris on Wednesday. 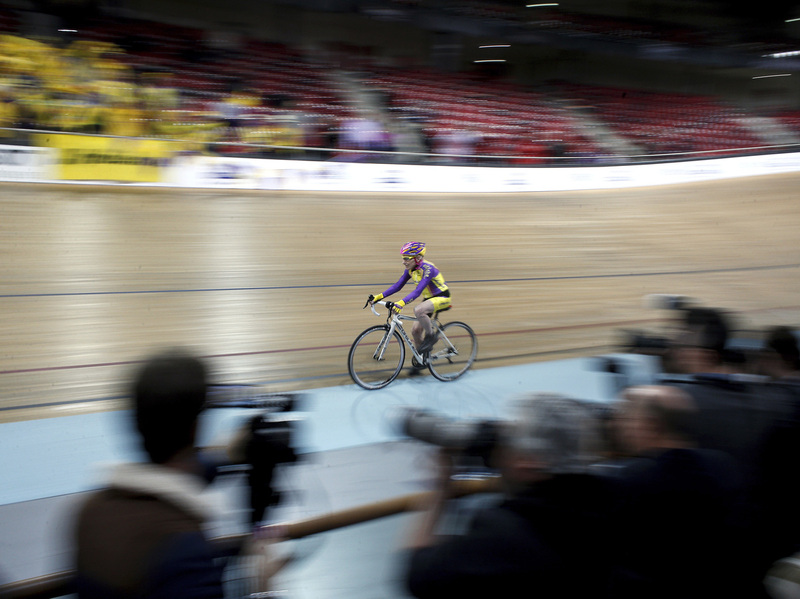 Wearing a purple and yellow cycling suit, pink helmet and yellow glasses, Marchand completed 92 laps at the Velodrome National, an indoor track near Paris that's used for elite cycling events. 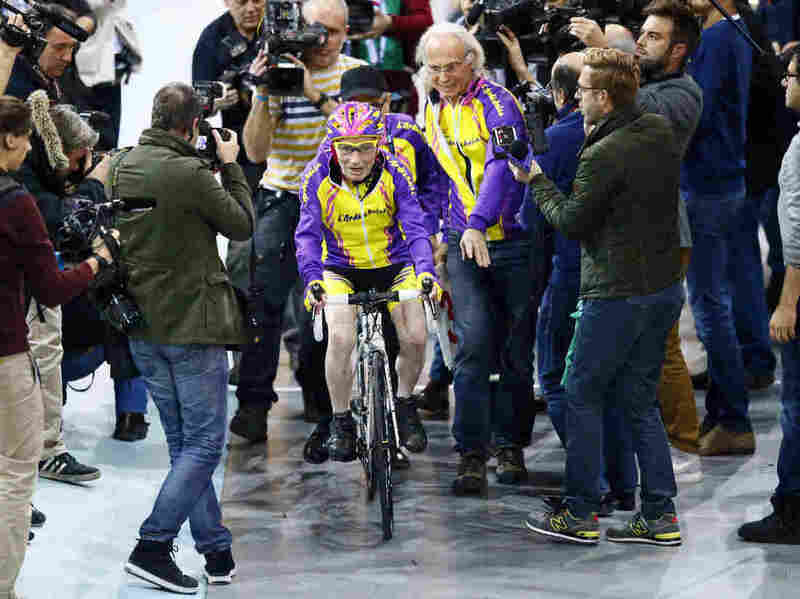 According to The Associated Press, he set a new record for the 105-plus age group and received a standing ovation from people in the crowd, who chanted "Robert, Robert" as he rolled to a stop. Still, he said he could have done better. "I did not see the sign warning me I had 10 minutes left," Marchand said, according to the AP. "Otherwise I would have gone faster, I would have posted a better time. I'm now waiting for a rival." For comparison, the U.K.'s Bradley Wiggins rode 54.526 kilometers (about 34 miles) in 2015 and holds the record for the men's hour, the BBC reported. "I am not here to be champion. I am here to prove that at 105 years old you can still ride a bike," Marchand said, per Eurosport. "Marchand, a former firefighter who was born in 1911 in the northern town of Amiens, has lived through two world wars. He led an eventful life that took him to Venezuela, where he worked as a truck driver near the end of the 1940s. He then moved to Canada and became a lumberjack for a while. "Back in France in the 1960s, Marchand made a living through various jobs that left him with no time to practice sports. 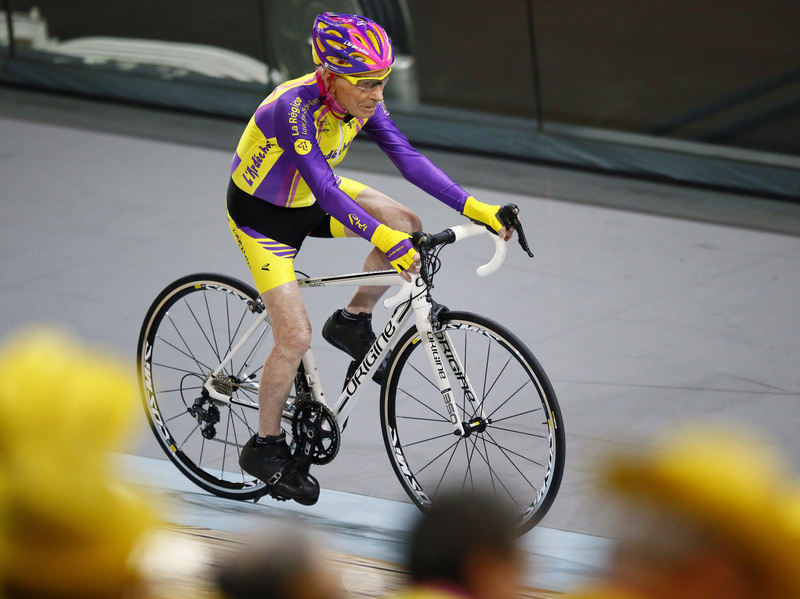 "He finally took up his bike again when he was 68 years old and began a series of cycling feats. "The diminutive Marchand — he is 1.52 meters (5-foot) tall and weighs 52 kilograms (115 pounds) — rode from Bordeaux to Paris, and Paris to Roubaix several times. He also cycled to Moscow from Paris in 1992. "Ten years later, he set the record for someone over the age of 100 riding 100 kilometers (62 miles)." So what's his secret? Marchand's coach and friend Gerard Mistler told the AP it's simple: He eats fruits and vegetables, doesn't smoke, drinks wine only on occasion, goes to bed at 9 p.m. and exercises every day. Mistler, perhaps cognizant of the cloud of doubt that hovers over impressive cycling performances, told the news service: "If [he] had been doping, he would not be there anymore." As if this story couldn't get any better, here's some amazing photos of the feat. "He's got two essential qualities. A big heart that pumps a lot of blood, and he can reach high heart beat values that are exceptional for his age," Marchand's physiologist, Veronique Billat, told the AP. "If the president of his teenage club who told him he was not made for cycling because he was too small could see him today, he would kick himself," Marchand's coach and friend Gerard Mistler told The Associated Press. The centenarian was mobbed by members of the media at the velodrome on Wednesday.